On my son’s 15th birthday, we celebrated by taking a walk in the forest of Ngamba Island in Uganda with a dozen orphaned chimpanzees. You read that right. I don’t know what possessed me to rent out our house for two and a half months so I could take Ari on a trip through Africa, Australia and New Zealand, but that is what we did. Our journey began in Uganda with each of us loaded down with baby chimps — one on each hip and another on our backs as we leapt over fire ants while trying to absorb the unbelievable circumstances in which we found ourselves. Our trip continued, spending time with tribes far off the beaten path, volunteering at the compound of former Black Panther Pete O’Neill in Arusha, going on safari in the Ngorongoro crater, and after a 49 hour flight, spending a month exploring the magical North and South Islands of New Zealand. I am ever so glad that I found a way to share such a life-changing adventure with my son at such an impressionable age. 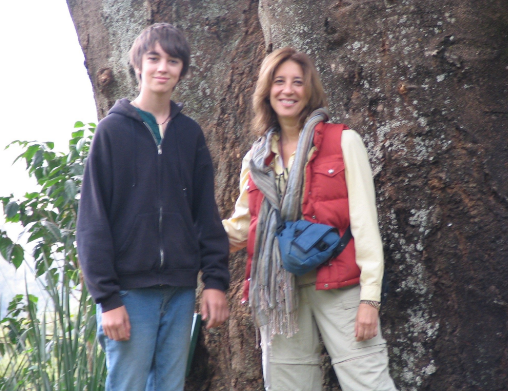 And…there were days when I thought I must have been out of of my mind to plan a trip with my fifteen year old son as my constant companion. We love our kids… but sometimes it’s not so easy to like them, especially at those times when their developmental imperative is to grow away from us — often most easily accomplished by finding everything we do or say annoying. There were a number of things I learned from being in such close quarters with my teenage son for an extended time. 1. Don’t take things personally. This is easier said than done, but after weeks on the road, I finally had no choice but to accept that not every irritating thing my son said or did was personal. Understanding this allowed me to laugh more and cringe less. 2. Don’t take anything personally. Oh right — I said that! But it’s so important, I have to mention it again. When a chick grows too large for the egg it’s inside of, it has to peck at that shell to crack it open so it can emerge into the world. Sometimes, we’re the shell. The pecking isn’t personal. 3. Listen with a humble heart. Remember when I advised you (twice) not to take things personally? I meant it, but that doesn’t mean that your kids–who have been observing you astutely their whole lives–might not have meaningful input for you. (During my son’s adolescence, he referred to it as “constructive criticism.”) As painful as it is to hear, there are times when your kids are spot on. Listen and learn. 4. Keep anchoring to love. When our teens are being yucky (a clinical term I often use), it is hard to remember how much we love them. Watch them as they sleep. It helps a lot. 5. Learn. The free online summit I’m hosting in April on raising teens and tweens is loaded with fantastic information and guidance from some of the most respected experts in the field. Gosh, I wish I’d access to something like it before my son hit his teen years! Take advantage of the free window of opportunity to learn more about the adolescent brain, find out how to stay close while letting go, and discover effective ways to deal with those bumps in the parenting road. 6. Get a life. It is the job of your tweens and teens to slowly but surely venture forth from the safety of the family nest toward the big, wide world. Stay present and engaged, but make sure you have interests beyond your kids so that you can maintain a healthy and balanced life. Ari is now twenty-six, and he still lights up my heart when he walks into the room. Not long ago, he stayed with us for a day or two. One afternoon, he and I went for a walk in the woods. We spoke for a while, and then walked in silence, simply enjoying one another’s company. This love is unlike anything I could have imagined. It splits my heart wide open. It has brought me to my knees. It is transformative. As your son or daughter sets forth on the road to his or her adulthood, there will be bumps in the road. Stay the course. Don’t take things personally. Keep learning. (Click here to join me in April for our exceptional series.) And enjoy your life. May your adventure in parenting be filled with just enough challenges to inspire you to grow. But mostly, may it be filled with the joy that comes from watching someone you love so dearly become more of who he/she is meant to be. It is the ultimate adventure. Originally published at susanstiffelman.com on March 24, 2017.